Once your baby is at least 6 months in age, it is time to introduce some solid foods. But, have you ever looked on the back of a jar of baby food or a box of rice cereal? Yikes! The first thing you may notice is added modified starches, sugars, corn syrup, and other additives—even in the organic ones. Your baby certainly doesn’t need any of these things, and some could even be outright harmful. The second thing you may notice after reading the ingredients is that there is almost no nutrition in jars of baby food or boxes of rice cereal—again, even in the organic ones. With the exception of a little added Vitamin A or C, packaged baby foods have nothing to offer your little one except mush to fill the tummy. Lastly, what you cannot see (and what is not on the label), are the arsenic, pesticide, herbicide, BPA, GMOs and other toxic chemical residues that were part of growing and processing the food in the jar. These hidden ingredients have no place anywhere near your baby! The good news is that making your own baby food is very, very easy, and is one of the best ways to ensure the quality of nutrition your child gets for healthy growth and development. It’s also very inexpensive, compared to baby food you buy in the store, and requires no resource-intensive packaging or shipping to the store. 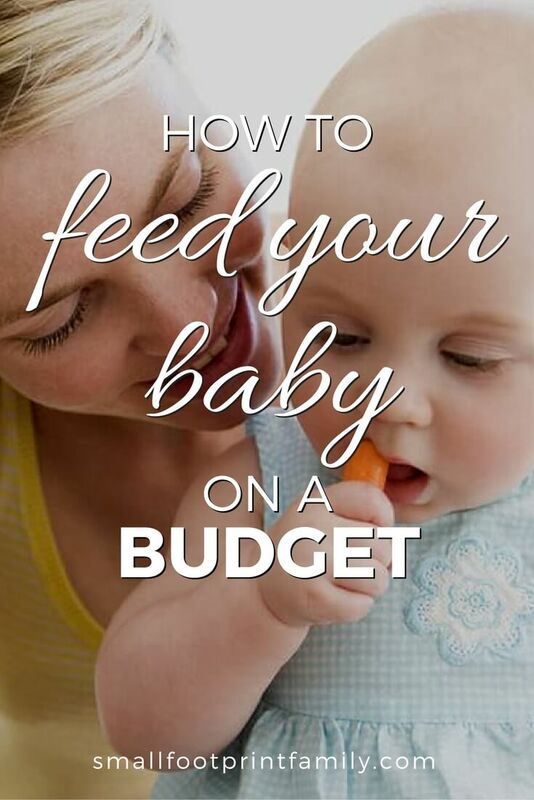 In fact, making your own healthy baby food can save you over $600 a year! And you can feel really good knowing that you avoided using and polluting all the natural resources that go into packaging, shipping and disposing of store-bought baby food. On the weekend or during regular dinner cooking, simply separate out some of the organic food you are already eating (or leave it raw, depending), blend in a food processor or blender, then freeze the purée in non-toxic, silicone or stainless steel ice cube trays. Make sure whatever you are saving isn’t too spicy, but a little seasoning teaches your child to appreciate normal food (rather than special “kid food”) right from the start. Once the foods are frozen, pop them out of the trays and put them in a freezer-safe glass container to keep them from getting freezer burn. Thaw and reheat a cube or two for each meal. If you just don’t have the time or inclination to make your baby food, many brands of organic baby food are now available. Some of these brands are in the freezer section, and are made from fresh produce that’s minimally processed, which maintains more of the original flavor, color, and nutrient content than the jarred stuff. Your baby sits with the rest of the family at mealtimes, and joins in when she is ready. You offer her food in sizes, shapes and textures that she can handle, and she feeds herself with her fingers, choosing what to eat, how much and how quickly. Gradually, your baby eats more and more solid foods and less and less breastmilk or formula, according to their own unique developmental timeline. Finger-sized “sticks” of organic, steamed carrots, skinned zucchini, apple, avocado, or pear, or even bits of hormone-free, grassfed ground beef, hard-boiled egg, or minced chicken are perfect, highly nutritious first foods when doing baby-led weaning. And, if you’re not too grossed out by the idea, you can even pre-chew some tougher foods and offer them to your baby. The enzymes on the food from your mouth actually help her digest them better! This is the way we introduced solid foods to our baby with great success. Her first foods were homemade hummus, fresh strawberries, and liver! It’s surely much more exciting to be able to exercise a bit of control over your diet and share in a bit of what mom and dad are having. And it’s so much easier on parents too! I have a baby on the way, and definitely plan to make my own baby food. A friend turned me on to refillable pouches, and I found some awesome ones on Amazon. There are several brands available. I went with “Squooshi” because they’re BPA, PVC, phthalate and lead free, plus they have cute animal pictures. You just fill them, freeze them, then grab and go. No ice cube trays needed, and you can put them in the dishwasher. They’re kind of pricey, but I know I’ll save a bundle in the long run, not to mention the environmental impact of the disposables. I just have to make sure my husband knows not to throw them out! Thank you for the informative blog. It will help me a lot to make baby food for my baby which will healthy as well as full of nutrients and vitamins. keep sharing this type of blog and share your knowledge with a mom like me. Thanks for sharing this kinds of valuable info. It will be so much useful for all the mothers. Really so much glad to find this post. Great job. Keep going. Very very instructive & explanatory post. So much glad to find your article. Will help me a lot. Hope my baby will be a lot healthier. Thanks a lot for sharing. I’ve been reading about making baby food and I’ll have to admit that this was very helpful. The weaning idea where you let the baby join in when he or she is ready has to be a stroke of genius! I’ve managed to let my baby sit with the family and she enjoys it so much. I am curious as to how long you can keep the frozen foods before the nutrients are drained. I am the originator of the term ‘baby-led weaning’ and am delighted to see it mentioned here. (Note: I didn’t invent it – parents have been discovering it for themselves since time began – I just gave it a name.) I do want to clear up one misunderstanding, though: BLW is not, in fact, advocated by UNICEF or the WHO. I just happened to be working for UNICEF when I began researching and speaking about it. As a result some journalists put two and two together and came up with five. These two organizations are not against BLW (and they do both advocate leaving solid foods until 6 months) – they just don’t have a position on it. Gill, It’s so nice to have your comment! Thanks you for clarifying the UNICEF/WHO reference. If BLW is not indeed advocated by these two groups, perhaps it should be! What a great way for parents worldwide to provide fresh, unprocessed food to their babies affordably. I am so glad to see you mentioned baby-led weaning!! We followed this approach with our son and would love for more people to become aware of this method. I think it’s contributed to to his healthy and well rounded appetite, among other benefits. It’s so common sense once you learn about it. Heather, it was very natural for us too, especially since our daughter refused the high chair. She’s always wants to do things herself. Baby-led weaning makes mealtimes easy and enjoyable for the whole family.